Every now and then a piece of gear comes along that changes the paradigm. 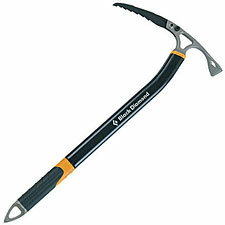 Such is the case with Black Diamond's Venom ice axe. The Venom directly addresses the dilemma of having to choose between a general mountaineering axe and a technical ice tool. An all-around mountaineering axe will be used for many tasks, including as a walking stick and a self-arrest/self-belay tool. A technical ice tool, on the other hand, is used exclusively for ascending steep, technical ice. The myriad functions of a mountaineering axe make it darn useful to have along on almost any adventure. Unfortunately, that means you've also got to carry ice tools whenever you'll be facing a pitch or two of ice. The choice between the two becomes even more vexing when you're not sure whether you'll be climbing snow, ice, or both. If you bring a mountaineering axe, you won't be happy if ice shows up. If you only bring ice tools for snow, you similarly give up a lot of functionality. The Venom is a hybrid axe: it sits nicely in the gap between mountaineering axe and ice tool. In the Adze version, the Venom looks and feels a lot like a general axe. The pick is angled so as to allow effective self-arrest, you can chop steps, and (at an optional 57cm in length) you can walk comfortably with it. Encounter blue ice, however, and the Venom proves to be a fine performer, with an angled shaft and an aggressive-enough pick to get a nice bite. In the hammer version, the pick is even more sharply angled. Both picks are available as interchangeable options for either axe. I chose the Venom for my ascent of North Palisade's U-Notch Couloir. The Venom proved to be an excellent performer on both snow and ice. The axe was comfortable in hand when walking and easy to use in self-belay position for lower-angle climbing. I especially liked the Venom's added security on ice. The spike is sharp, offering excellent bite, setting itself into ice with a solid thwok! What are the compromises? Compared to a top general mountaineering axe like Petzl's Snowalker, the Venom is slightly heavier. As for self-arrest ability, in the Adze version I don't think you've giving away much if any functionality. You will notice the greatest drop in performance when comparing the Venom to a true ice climbing tool on steep or overhanging technical ice. But in all fairness, the Venom was not designed to compete in that realm. Rather, it is best thought of an as extension of a general axe's range. For most situations, one Venom or a Venom plus an ice tool will be more than enough to keep you climbing happily.